Few weeks ago one of our readers reached out that our site wouldn’t load for them. We traced the issue back to how our site’s internals had been set up—ala the DNS, web-server (we use nginx) and Linode. We were not listening for requests over the IPv6 network. I recently happened upon the Bubblin blog while I had only IPv6 enabled. Unfortunately it lacks IPv6 support and thus failed to load. Is this something that could be fixed? 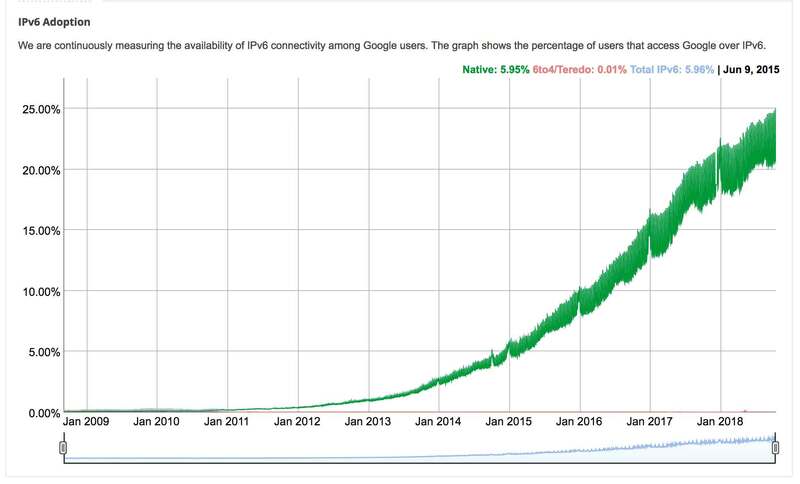 Google came out with stats on IPv6 adoption lately (October 2018) and the numbers are rising steadily. Twenty five percent of the web is using IPv6 and from the graph it appears that over half will be onboard in just a few years. It is therefore important to adapt and be ready for the change-over and that is exactly what we did for Bubblin. The first step is to add an AAAA Record on your DNS Manager. You’ll need a public IP on IPv6 so you might have to request it from your hosting provider. We’re on Linode so we went ahead and added it from our Remote Access panel. Changes to DNS take some time to percolate so the next step we’re going to focus on is configuring nginx for IPv6. #  add listen [::]:80 ipv6only=on; for requests via insecure protocol (http). #  add listen [::]:443 to listen for requests over IPv6 on https. # Other SSL related stuff here. # add listen [::]:443 ssl http2; on the final server block. // Plenty of nginx config here. The page from your site should load correctly. Follow me on Twitter or on Github. P.S. : Did you know that Bubblin Superbooks is a blissful new way to read and share books on web.